This is a discussion regarding the research I have done about the colors and placement of the running lights and turn signals on early North American Spitfires. Anyone that can clear up my questions please . I was noticing recently that the front lights on the early cars on the site were all different. Different sizes, colors, and locations. What I am determining from looking at many cars, talking to owners and viewing factory photos (sales brochures and books) is that broken lenses were often replaced with different ones because of either owner/repair shop ignorance or correct lenses were not available. I know that North American Spitfires changed from a small Amber lens to a large white (with amber bulbs) in late 1964. I cannot determine yet the exact Commission number. I am also finding some evidence that the factory also did not really know what color to put on during late 1964. I have seen a large amber turn signal lens (the same as the white only amber). It seem to used for a very short period of time before becoming the large white lens that ran from late 64 until the Mk3. A guess is that it was during the time when the US government was enacting legislation about running, blinker and side marker lights they announced to car companies POSSIBLE color changes and Triumph enacted them before they were official. Once official, the color was not the same and a few cars left the factory with Amber lens. This is only a guess. 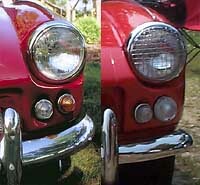 This is evidence that there was also an amber version of the large lens for cars manufactured late in 1964. This car is Comm. Num. FC43423L manufactured Nov. 1964. The owner is very positive that the lenses are original. According to the Victoria British catalog the small amber lens ran up to FC25312 but do not mention the large amber lens for Spitfires. Anyone with more information or exact commission number of the change or have an original car (or a car that you know has original lenses), please email me. I would like to "guestimate" the approx. date/comm number.